I have seen two kind of "paracord people" keychains. Of those, I am assuming that the cobra weave is the original design. 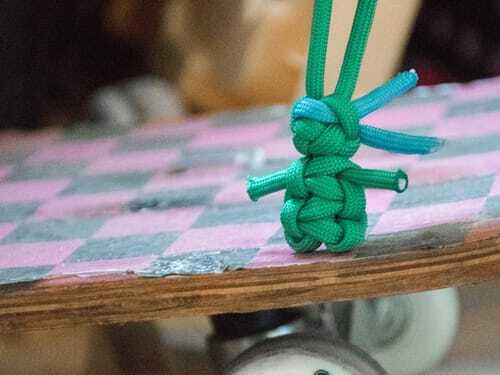 Lately though, I have been seeing an increasing number of paracord people made with a different knot. In my opinion, these smaller people look a lot cooler than the original. Let me know in the comments which one is your favorite. I have said this before, but once you learn the knots involved, the rest is self-explanatory. Start with a bead on top, The middle strands turn into the legs, begin the cobra weave at his waist and work your way up his torso. When you get to the head, leave a couple of inches extra for arms, and you're done! With this basic design, you can add all kinds of customizations to it. Make anything from Jedi to ninja turtles with this design. Recently I discovered a new kind of paracord person. I like this kind a lot better. The cobra weave is great for a bracelet, but I really like the snake knot for paracord people. The main draw of this version, is its size. Since people like to use paracord people as key chains and zipper pulls, the snake knot is�I think�a much better size. They remind me of the "little green army men" that I grew up playing with. These are pretty customizable as well. keep reading for inspiration! This version usually uses a diamond knot or a bead as a head, followed by 3-4 snake knots for the body. Fold your cord in half and leave a little at the top to attach it to a keychain�or don't, because that works too. Make the diamond knot for the head or replace it with a bead. After the first snake knot of the body, place a 5 or 6 inch piece between your strands before tying the next snake knot. This will be the arms. Alternately, you can thread it through afterward with a fid. 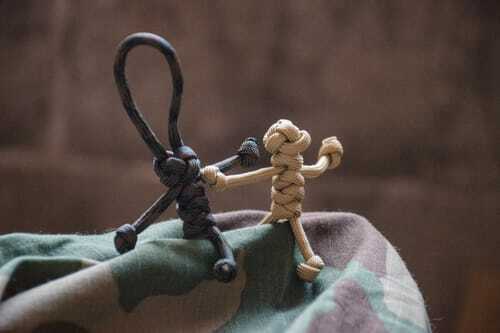 The hands and feet are made from a simple overhand knot. 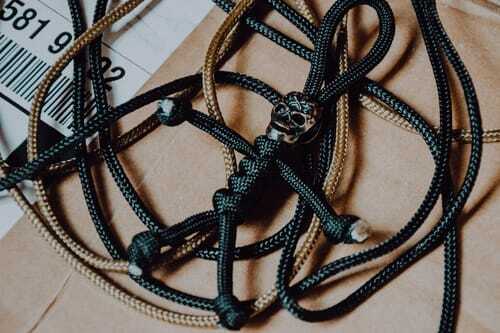 The Laura Croft one I teased with in last week's blog was made the same way as the standard snake knot person. I just spliced the cord at each color change. Do this by melting both ends and then holding them together, end-to-end until they cool. The bow was made by taking out the inner strands and replacing them with a thick wire. 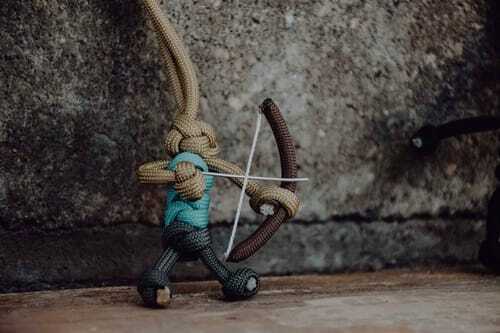 The bowstring was made from melting one of the inner strands to the bow. Are you fan of the dead and the undead? Skeletons, zombies, and mummies look awesome hanging off a backpack! Look down at the end of this article for links to buy skull beads. 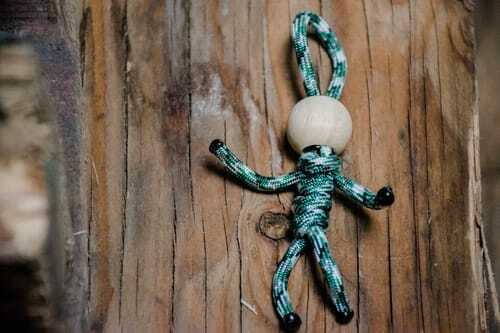 We have a great tutorial for how to make paracord mummies. Check it out! Make the limbs poseable by adding some stiff wire inside. You can either take the inner strands out to make room for some thicker gauge wire, or you can do like I did and just use a paper clip�which fits inside easily without removing the core. Wooden beads make pretty good heads. The best part is�you can draw faces on them! Who would have thought that you could make a convincing Teenage Mutant Ninja Turtle out of nylon rope? I know I said I don't really like the cobra weave, but this is definitely my favorite application of it! 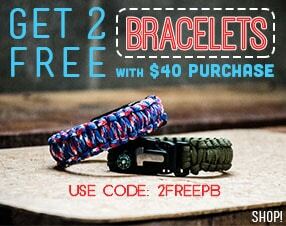 And probably one of my all-time favorite things made out paracord. Do a Google search for paracord people. you will find all kinds of things to make! 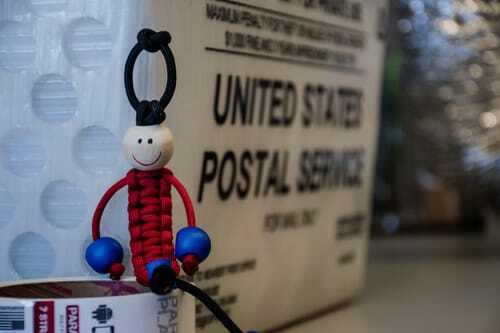 I hope to feature some paracord people again sometime in the future. There are some pretty big movies coming out this spring and summer! If you find yourself lacking any of these goodies, head over to our store! 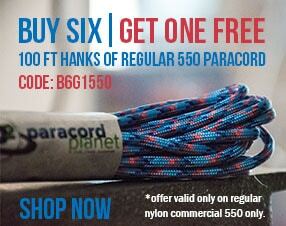 P. S. If you don't have a Tactical Rope Tool yet, check them out! They aren't just for the survivalist. They seriously cut better than scissors! They are even safer than most scissors for kids. Tap the picture below to take a look.